August 2006: The East Stand looked a little like it has been unpacked from boxes from Ikea and was waiting to be reassembled. The skeleton of the "new" stand was all that remained of the structure following demolition of the West Stand and South Terrace. Meanwhile, the Tinshed stand remained in use as the sight-screen for the cricket club. March 2006: The bulldozers and demolition people moved in and starting clearing the stadium. 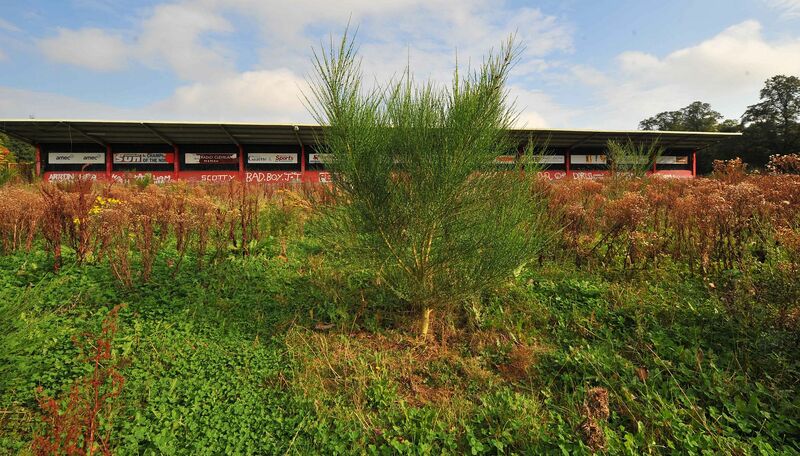 The first stand to go was the derelict West Stand, followed by the open South Terrace. 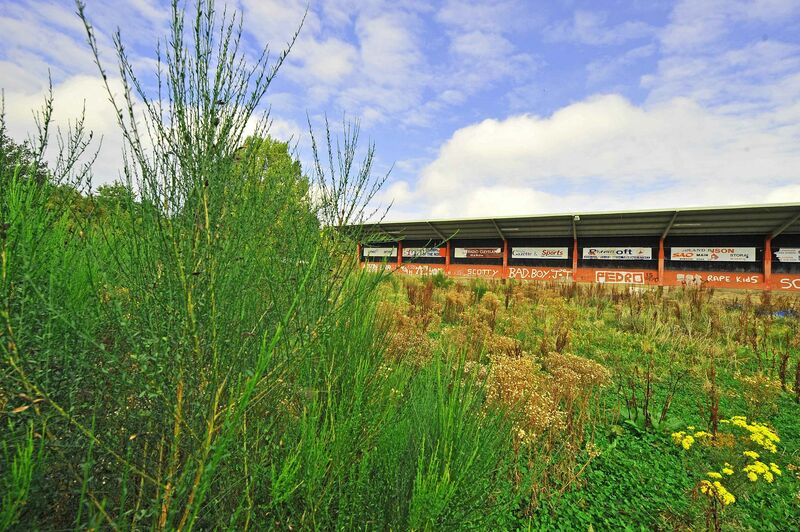 Fixtures and fittings in the East Stand were removed, while the Tin Shed cover and roof remained intact - hinting that it might find a home somewhere. © Photos: Ted Blair. January 2006: Take a long, last look. 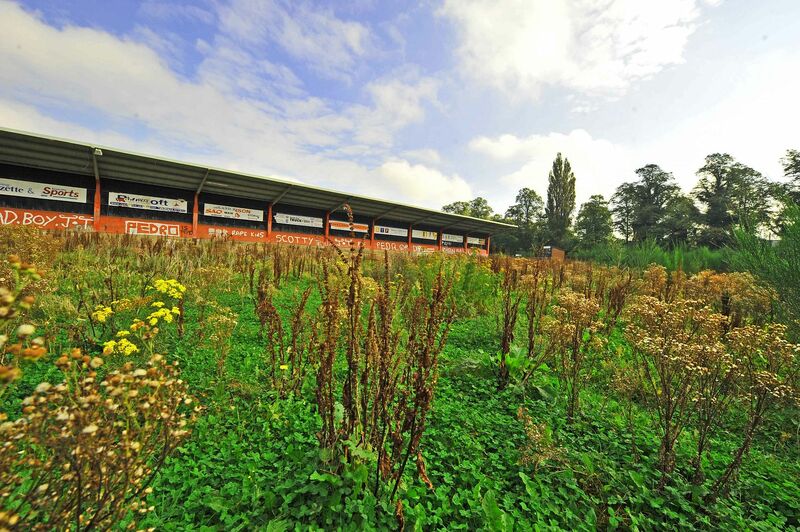 Feethams as a football ground - albeit a decaying one - is likely to disappear by April, after the council gave the go-ahead for the stadium to be bulldozed. The ground is officially "unsafe." Not a surprise, given that it has scandalously been left vunerable to vandalism for two and a half years. Scandal is not too strong a word, in that it seems almost deliberate neglect has allowed the future of the ground to move up the agenda to the point it has become a safety and embarrassment issue for the town. The "cricket club trust" are typically quiet on its future, although you suspect they would be very disappointed if they were not allowed to sell at least part of the ground for residential development. What is indisputable is that the ground was bequeathed for the town, not any individuals to benefit. The loss of an open space or amenity would be tragic, especially if it was to become yet more housing. The Northern Echo have backed calls by the Supporters' Trust for the ground to be kept for community or sporting use. © Photos: Ted Blair. December 2005: As it looks now, the stadium has been badly vandalised and neglected. The Cricket Club have secured the ownership of the assets and land, and this is likely to lead to demolition and the site being sold for housing. This has caused some local opposition, bearing in mind the history of the ground being donated to the town by the Victorian Quaker family, the Peases. Who knows what the next stage will be. The floodlights have been removed already. What's particularly sad is what appears to be almost reckless neglect, with vandals almost encouraged along to hasten a quick decision by the planning people. There is certainly no proper excuse for the ground not to have been properly secured over the last 12 to 18 months. It would be something of a travesty for the town if the ground wasn't turned into a proper amenity or open space that the community could make use of. © Photos: Ted Blair. November 2005: One of the pylons is disassembled and then on its way from Feethams to its new home. The floodlights at Feethams departed at the end of November 2005, for a new home with the Workington Reds football club. The pylons, first erected 45 years ago and switched on for a night game with Millwall, departed after a deal was struck with the Cricket Club. © Photos courtesy of Brendan Boyle. February 2005: It appeared there was a possibility the ground could be eventually turned into housing. There was a wrangle between the cricket club, who own the ground, and the football club's administrators, who had a claim to the £3m East Stand, only built in 1998 and which was seen as an asset. The ground is operated by a trust, involving the cricket club, which leased Feethams to the football club. Then manager David Hodgson was also reported to be intersted in taking out a lease to develop a five-a-side academy. It looked likely that eventually the old West Stand, built in 1960 and ramshackle, would eventually be demolished and the Tin Shed terrace would need some work doing to it. The toilets and bathroom fittings from the East Stand apparently got a "free transfer" to the new stadium. January 2005: The Northern Echo's Sam Strangeways reported rather grimly: "Mould covers virtually the entire carpet in the grim, dark Ambassador Suite, while the ceiling is full of holes. Several bottles of lager remain untouched on the bar, next to a programme from Darlington's Worthington Cup clash with Sheffield United in August 2001. The executive boxes above are empty, loose wires protrude from every corner, while smashed glasses and dead insects line the corridor outside. In recent years, the adjacent West Stand had not been the prettiest of sights anyway. Now, it looks beyond hope. Gaping holes pepper the steps leading to the seats, the small terraced section below covered in old ticket stubs Darlington v Torquay, December 28, 2002; Darlington v Halifax, April 1, 2002; Darlington v Hartlepool, March 1, 2003.... "The South Terrace is little better. Broken pieces of advertising boards adorn a sodden, dilapidated structure. 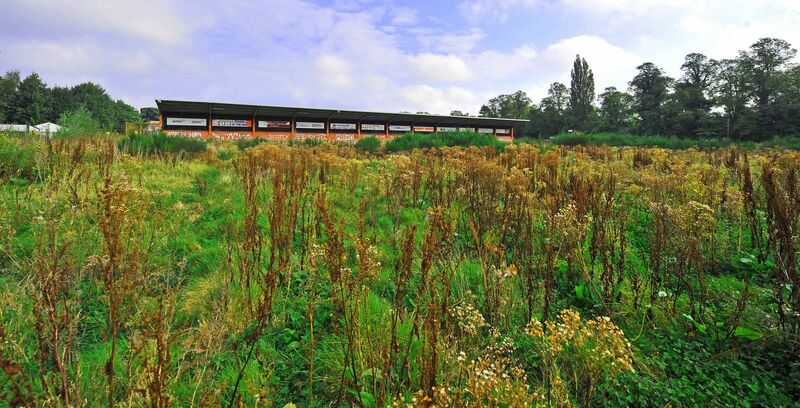 There will have been many among the 5,750 present at Feethams' last ever league match in May 2003 who hoped the old venue would enjoy a prosperous future following the Quakers' departure " "Today, such a hope still exists. But whether it eventually becomes a reality remains uncertain." Some of the "Dream Team" pictured on the pitch before the final Feethams match in May 2003. The Best XI picked in a poll of supporters were: Mark Prudhoe ; Ron Greener, Craig Liddle, Kevan Smith, John Peverell; Andy Toman, Alan Sproates, David McLean; Alan Walsh, Marco Gabbiadini ,Colin Sinclair. Darlington Supporters' Trust organised the Farewell to Feethams project to mark the historic move to a new ground. From January to April 2002, hundreds of black and white photographs of the old ground, supporters and the match day atmosphere were taken by members of Darlington Camera Club. The best work from 15 members was shown at an exhibition at Darlington Arts Centre that summer, out of 1,200 photos taken. The show, which opened on July 12th 2002 and overlapped with the start of the new season in August, also included a photo archive, with other elements including a selection of fans' written and recorded memories, Feethams landmarks and memorabilia. The new photos were also exhibited at Greenfield Community College and Arts Centre, Newton Aycliffe, the Green Dragon Museum and Gallery in Stockton-upon-Tees and the Discovery Centre, Bishop Auckland (June 2003) before the show is expected to go on permanent display at the new stadium next season. See also the Farewell to Feethams web pages for online exhibition.